"Turntable" may appear to be something vintage; something of the past to a lot of people. But for us, analogue lovers, it's more than that. Not just a piece of art, it's the key which leads us into the wonderful world of analogue music! Bill of Melbourne has just joined us in the journey of tweaking and enjoying beautiful analogue music. I was on the look out for a turntable for my system, when a friend introduced me to the wonderful world of vintage hi-fi. I ended up buying off him a Rega Planar 2 in mint condition which he had for sale. TT came equipped with a 747 Grace tonearm. Upon first listen, I was impressd and never thought my records could be reproduced in such way compared to mid priced modern TT. Being new to vintage audiophile hi-fi, I decided to do a research on Rega and was surprised on how much information there is. Wanting to improve on the TT performance, you were mentioned in a forum and.......BANG! Turntable candy for Rega's. Over the past few months I have purchased your upgrades except for the sub platter and finally assembled all parts as per your instructions. Thanks heaps for sending me the smaller rubber feet to fit the aluminium iso feet as the originals were larger in size. I did not test every item individually to compare the difference from the originals, but made the comparison upon completion. Cartridge is a Micro Benz high output MC. Powering up and listening to favourite recordings was breathtaking. Bass, Mids and Highs were all transparent and projected with authority. Soundstage had depth and a three dimensional feel. The overall improvement is phenomenal. Thank you... and well done. Arthur of Now York is a lucky guy to have owned one of this rare finds! He is sharing with us here his Thorens TD124 with my Underslung Counterweight and Record Clamp upgrade. Enjoy! I wanted to send you a few pictures of my vinyl setup. I am running the Rega RB300 arm on the TD124. A great combination. As you can see, your counterweight and record weight has been put to good use. The counterweight really opened up some extended clarity and firmed up the bass. I am using the Denon DL 103 cartridge, which requires a more exacting tracking weight, and your counterweight makes this more possible than the stock one. For speakers I am running high sensitivity Fostex full range drivers so the improvement in clarity is very noticeable! The record weight is great also, adding a more steady pace. My next project is to upgrade the wiring on the RB300. It's a well-known fact among tweakers that the Underslung stainless steel Counterweight is one of the best upgrades available for Rega TTs'. 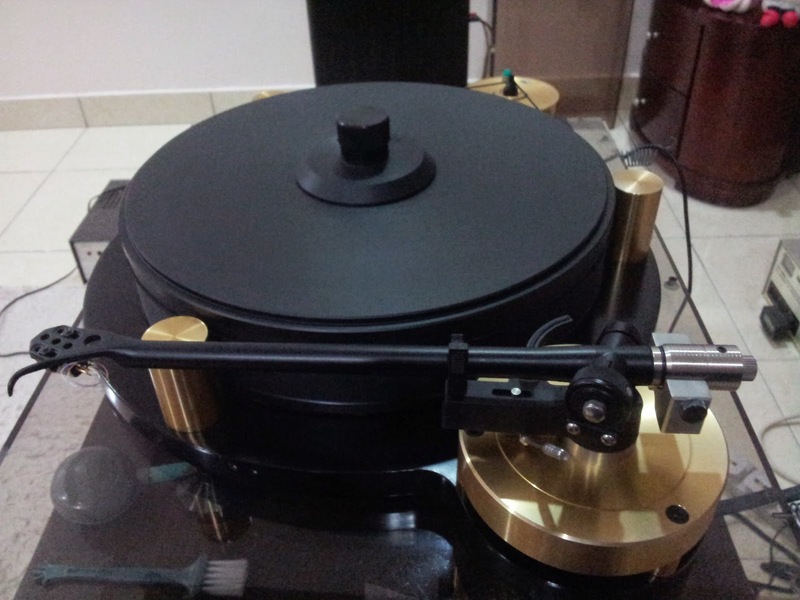 Jimmy Ng's (of Klang) Michell Gyrodec is with a Rega RB300 tonearm. So my Underslung Counterweight which is meant for all Rega tonearms could be fitted to it easily without problem. 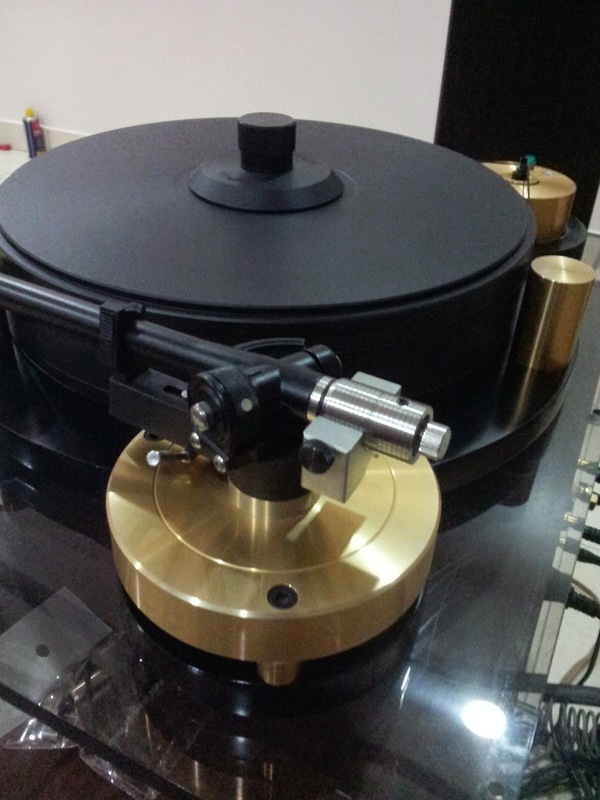 I m currently using a Michell Gyrodec with upgraded Orbe platter and clamp. Rega RB300 tonearm with van den hul silver wiring. Attached was the setup with your counterweight. Noticed a big improvement to the sound. Sound became more refine from top to bottom frequency. Separation of the instruments was marvellous.